This is a fun card trick that gives the magician the chance to tease his audience while he amazes them. The magician spreads a deck of cards and allows a spectator to pull a free choice. After memorising the card and replacing it in the deck, the spectator watches as the magician finds their card and reveals it - but it turns out to be incorrect. The magician holds out the chosen card, face down and insists that he got it right. When the spectator names the real chosen card, the magician turns the card over to show that it has changed to the correct card. Utilising the double lift allows the magician to get it wrong on purpose, setting up the amazing and comedic finish to the Changing Card. Only a normal deck of playing cards is required. No advance preparation is needed. The Changing Card is one of hundreds of card effects that fall along the same lines - the magician, full of confidence, performs a trick and expects applause and admiration, but he gets it wrong. Then, just when the audience is about to have fun at his expense, he shows who is the master with a surprise ending that shows he knew what he was doing all along. The magician spreads the deck of cards and gives the spectator a free choice. 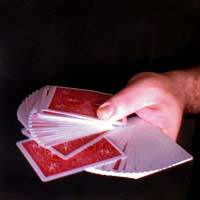 The magician cuts the deck randomly and asks the spectator to replace the card on the top of the left half. As the magician puts the top half back, he catches a break with the “meat” of his left hand, or with the tip of the left little finger. From here the magician can cut the deck, bringing the bottom half to the top, and the chosen card is now the top most card. Once the card is on the top, the magician performs a double lift; riffling though the cards, he catches a break under the top two cards with the tip of the little finger. Now both cards can be picked up as one. The spectator will deny this is his card. The magician turns over the packet of two cards and puts it back on the deck. As the spectator continues to deny that his card was the Three of Clubs, the magician deals the TOP card (the Ace of Hearts) into his right hand, face down. For the biggest comedic effect, the magician should be absolutely sure he got the right card on the first try - in fact, even at the final reveal his confidence should not waver, as if the spectator just imagined a different card at first.